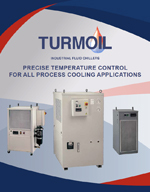 Non-Refrigerated Chillers Water Cooled | Turmoil, Inc.
Use central chilled water, instead of refrigeration, to provide close temperature control of recirculating coolants or oils. 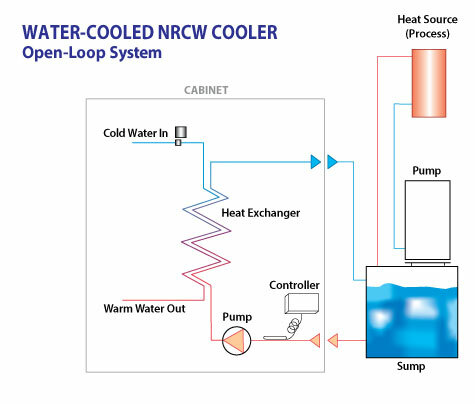 Any R-Closed-Loop or RO-Open-Loop cooler can be supplied with the NRCW option that replaces the standard refrigeration system with a water-to-coolant or water-to-oil heat exchanger. If chilled water is available at the installation, significant savings can be achieved in both initial and operating cost by using this chilled water to control the temperature of coolants being recirculated to your process. On all units, a digital temperature controller operates an electronic mixing valve to control the flow of chilled water through the heat exchanger to provide close temperature control of recirculating fluids. There are significantly fewer moving parts to maintain. Heat from the process is removed as warm water to a central location where it can be used or dissipated efficiently. Closed-Loop coolers recirculate coolant from a tank mounted in the cooler, through a sealed coolant loop and heat load (spindle) and back to the tank. The tank, pump, and evaporator are all in the cooler. 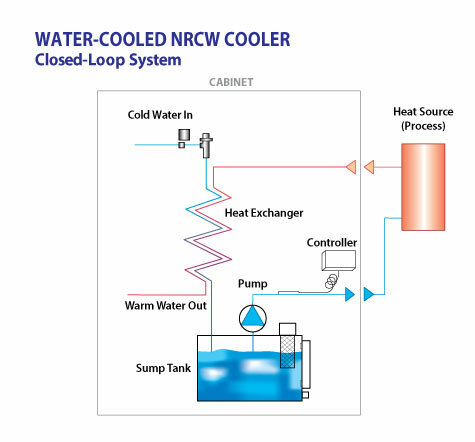 Open-Loop coolers recirculate fluid from a remote tank, through the cooler and back to the tank. The cooler works to maintain a constant fluid temperature in the tank. The pump and evaporator are in the cooler. The tank is remote. Chilled water must be at least 10°F (6°C) colder than the lowest desired coolant temperature and have adequate flow and pressure for the application. Consult Turmoil for requirements. CTC: Digital Temperature Controller. Provides close temperature control (±0.5°F). Displays bot set-point and coolant temperature. ATC: Ambient Tracking Controller. A dual input digital temperature controller allows the coolant temperature to track ambient temperature at a constant, adjustable differential. Displays both ambient and coolant temperature. OP: Optional Pumps. A variety of pumps are available to meet almost any flow and pressure requirement for both water and oil-based coolants. LF: Low Flow Interlock. Prevents damage to machine on loss of flow. HT: Temperature Fault Interlock. Indicates coolant temperature is out of range. LL: Low Level Interlock. Indicates coolant level is low. FSM: Flow Meter/Switch. Adjusts coolant flow to optimum setting. ILH: In-Line Heater. Warms up coolant to optimum operating termperature. ILF: In-Line Filter Insures clean coolant. PS: Pure System. Coolant only comes in contact with stainless steel or plastic. RC: Rubber Casters available on all models for complete mobility. PG: Pressure Gauge available for Discharge and/or Input. FOR FASTEST SERVICE: fill out this form. Heavy-Duty Construction. Coolers are designed for continuous industrial duty and dependable long life. Welded steel cabinet features lifting eyebolts and mounting skid. Panels are easily removable for complete access. High-Ambient Condensers. Oversized to run cool in hot, dirty environments. All condensers are protected with a cleanable aluminum air intake filter. Continuous-Duty Pumps. Designed for use with the specific fluid being cooled and the application. Rotary gear pumps for oils. Centrifugal, turbine, and rotary vane pumps for water-based fluids. Complete Temperature Control. Choice of analog or digital controllers available with options to hold coolant within ±0.5ºF (±0.25ºC) of set-point. Hot gas bypass unloading eliminates compressor short cycling. Super-Efficient Evaporators. For both oil- or water-based fluids. Brazed plate, immersion coil, or shell-and-tube design of stainless steel, copper, or steel construction depending on application. Tested for 350 PSI working pressure.